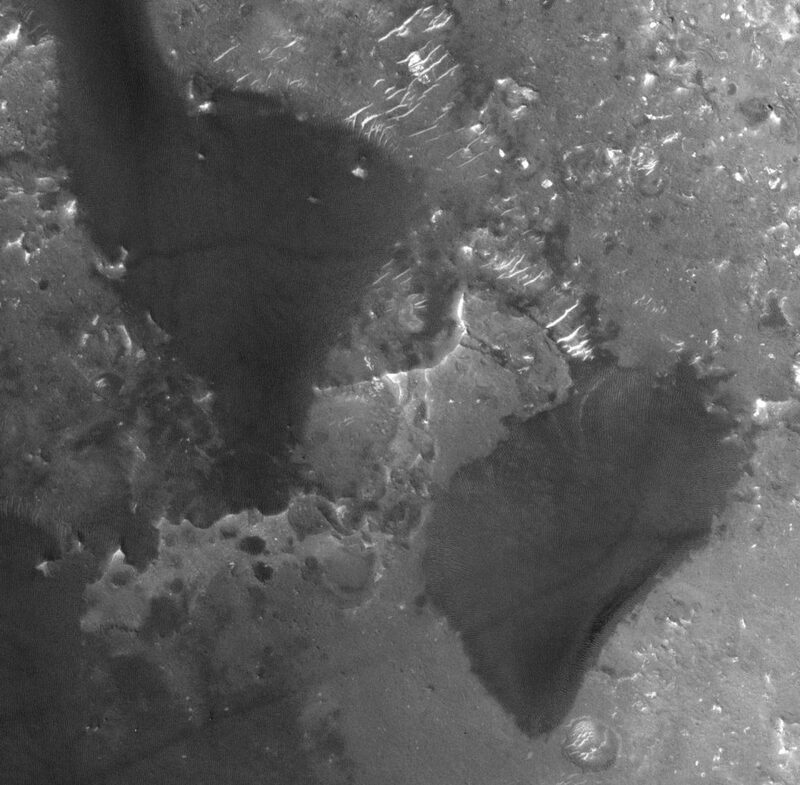 Richardson crater is located at 72ºS, about 1000 km (~621 miles) from the south pole of Mars. 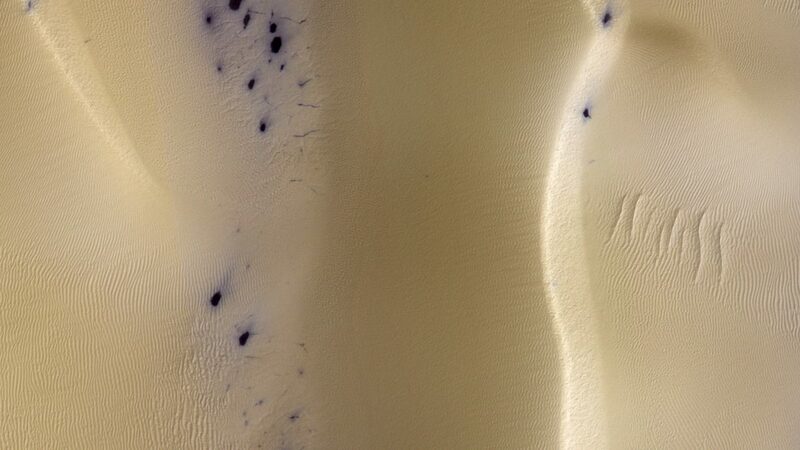 It’s a moderately large crater, about 90 km (56) miles across, and it’s mostly filled by one of the biggest dune fields in the southern hemisphere. 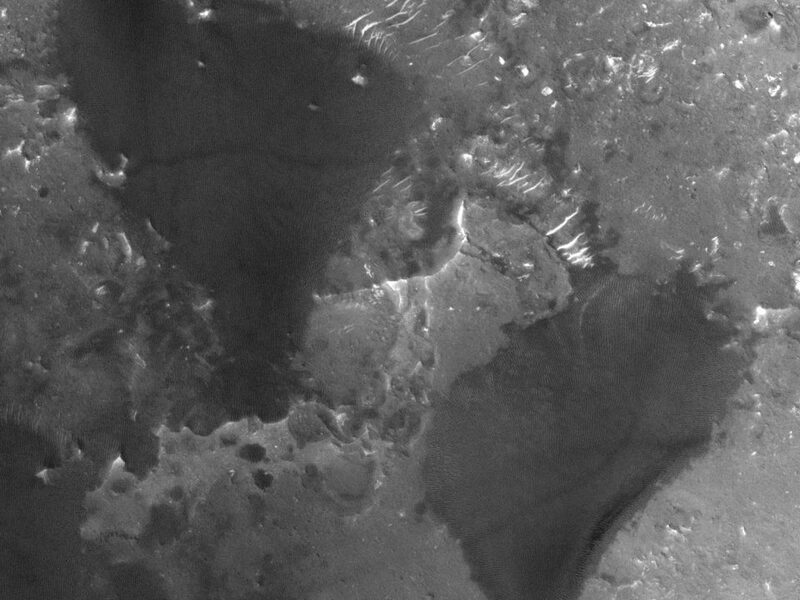 The dune field has been targeted repeatedly by HiRISE, with a recent count of 83 images. I’ve probably included images in my blog in the past, but a quick search shows I didn’t label them (and I’m far too lazy to go searching). But no matter, since there are plenty of brand new images of the place to keep us happy. If you’re confused by which way is up: the sun is shining from the left toward the right. 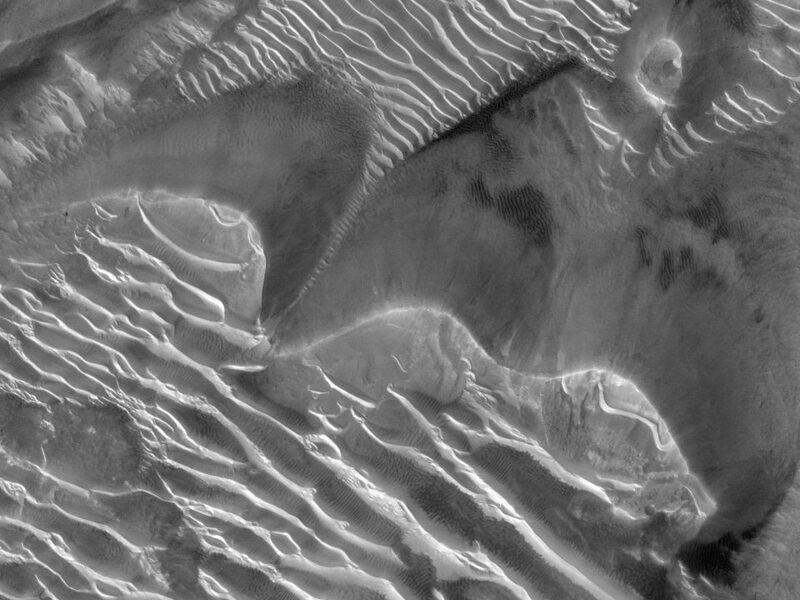 The curvy bright line down the middle center of the image is the crest of a dune. Its slip face is short and steep, to the right, and the stoss (windward) side is on the left, in the shade. This image was taken just after southern spring equinox. At this latitude, that means the dunes are no longer in polar night, and the sun spends a few hours hovering near the horizon every day. The dunes are bright here because they are still covered in seasonal CO<sub>2</sub> frost. 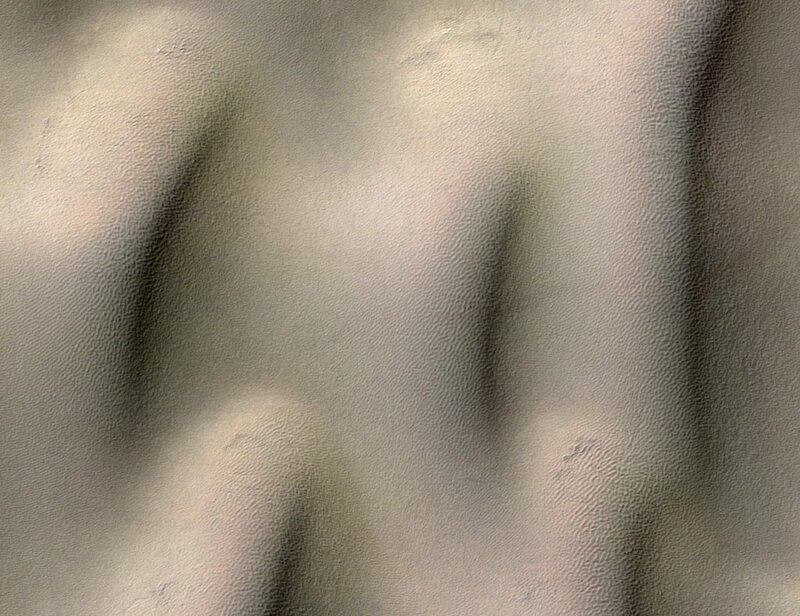 Dark spots have formed on the surface between the dunes (interdunes), at the vertices of a network of large cracks. These spots are caused by sublimation cracks that have broken through the seasonal ice. Dalmation spots like these are the hallmark of spring’s onset in this wintry crater. 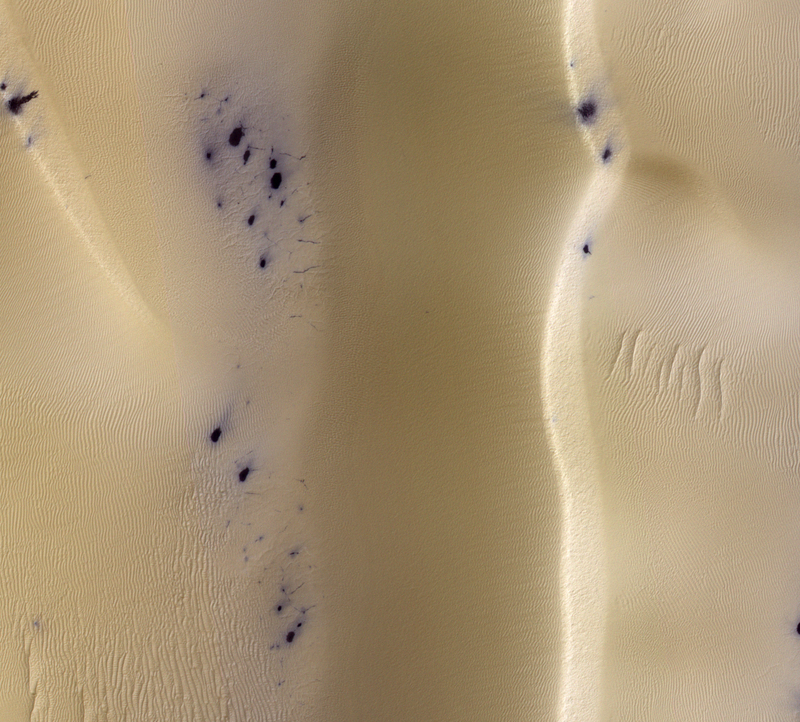 A few spots have formed on the sun-facing slip faces, spewing out dune sand that flows down the slope. 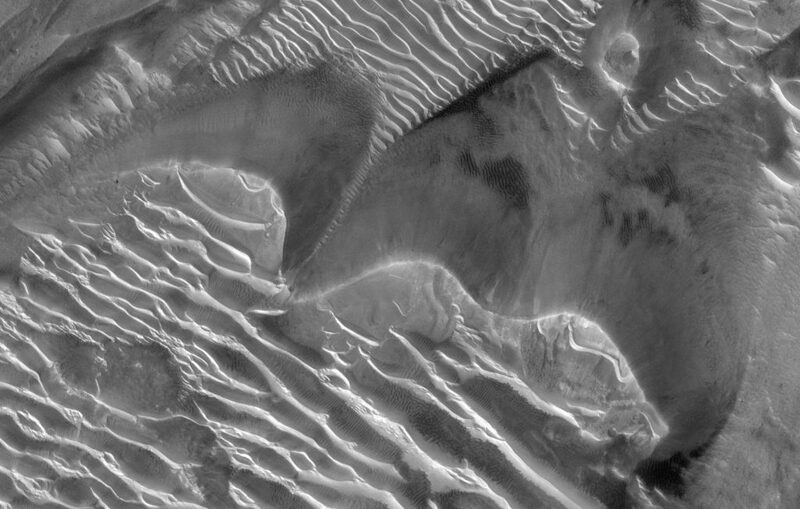 Over time the crack network will grow, and more spots will form on the dunes themselves. It gets a little messy, just as melting snow does in spring here on Earth. Come summer, when the ice is all gone and nothing but the warm dark sand remains, narrow furrows will be left where the cracks here are forming. As the summer progresses, the wind might activate the ripples, erasing the furrows so that next year’s cracks will form on a fresh surface.